The War and Peace research group investigate the causes, course and consequences of large-scale human conflict across a large period of History from the middle ages to modern day. We have academics with a wide range of research specialisms including military, international, medieval, political, cultural and social historians. We start at the Clausewitzian debate as to whether war is merely the continuation of policy by other means, or has either its own grammar or logic. We also tackle contemporary issues including European security; military intelligence; population transfer; soldiers and soldiering in the Napoleonic Wars; commonalities and differences in surrender; transnational military mobilization; and atrocities in Europe. War and Peace’s current projects include the University’s major Legacies of War initiative, externally-funded investigations into military intelligence and medicine in the First World War, and editing War in History, the world-leading journal for the study of the subject. Professor Edward Spiers received invitations from Home Command, British Army, to assist in chairing sessions, presenting a paper, and editing the proceedings of Operation REFLECT: Army conferences and staff ride. This involved two conferences and a staff ride. At ‘The First World War Conference: The British Army on the Western Front, 1914-1918’, held in the Royal United Service Institute for Defence Studies (17 July 2014), Professor Spiers presented a paper on ‘A Voluntary Army tested in War, 1914-1915’. Following the staff ride in Flanders (8-12 September 2014), he will chair sessions at the subsequent conference on ‘The British Army on the Western Front, 1914-1918’ that is due to be held in RMA Sandhurst (6 November 2014). 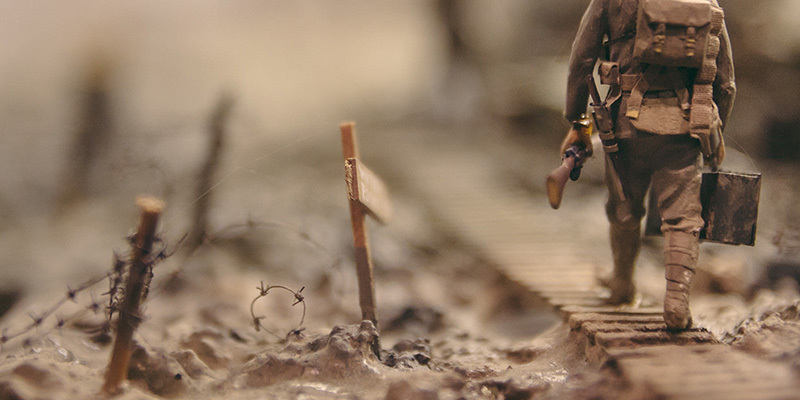 On 28 July 2014 Professor Spiers also delivered a paper on the ‘National Response to the onset of the Great War’ before a conference held at Weetwood Hall on ‘The First World War in retrospect’ (28 July – 1 August 2014). He will deliver a printed version of this paper to the conference director, Dr P. Liddle, for inclusion in the forthcoming book, Britain Goes to War (to be published by Pen & Sword). Professor Simon Ball is one of three UK members of an international scholarly advisory board that advises the Museum in its work. Find out more about the museum. . Explore our research projects directory to discover past and present research activity.